Bruxism is more common in children than you might think. It usually happens when kids are stressed out or getting used to a new routine, like around the start of the school year. Unfortunately, the habit can be really damaging to a young smile — maybe even worse than it is for your own teeth. A child’s tooth enamel isn’t fully developed until they are in their middle teens, so jaw clenching and teeth grinding can really wear away at those softer little teeth. After a long summer of staying up and sleeping later, it may not be easy to get your child back into a good sleep schedule — but it couldn’t be more important to protect their oral and overall health and help them enjoy a great school year. Remember that school-aged kids and early teenagers should be getting from 10 to 11 hours of sleep every night. It seems like a lot, but that’s what they need during these crucial developmental stages! Adolescents need 9 hours of sleep every night. You don’t have to wait until the first day of school to get your child back on schedule. Waking up a little earlier in the days leading up to school’s start can make it easier when the big day finally comes. To help make it easier for your little one to fall asleep earlier at night, make sure they stay away from caffeine and sugar in the late afternoon and evenings. Try to limit screen time before bed, too. The bright lights from phones, televisions, and computers can make it harder for the brain to shut down at night. In addition to helping your child get into a solid sleep routine this month, you can take their oral health and hygiene one step further by bringing them in for a back to school checkup and cleaning to start the school year off right. With that last point in mind, we encourage you to schedule a back to school checkup and cleaning for your little one this August! 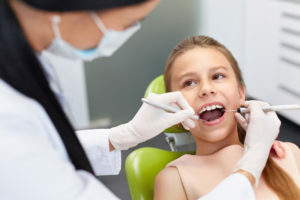 Dr. Jorgenson is the children’s dentist you’re looking for when you search for a “dentist near me,” so go ahead and request an appointment today!